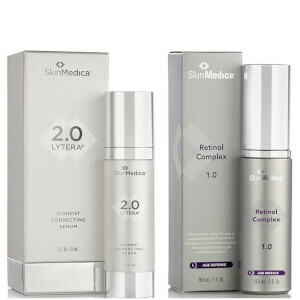 Address the appearance of stubborn skin discoloration with the SkinMedica LYTERA 2.0 Pigment Correcting Serum; an advanced formula that is suitable for all skin types. Enriched with Tranexamic Acid, Phenylethyl Resorcinol and a Marine Extract Blend, the potent serum helps to support skin’s melanin balance, encourage a healthy skin barrier and most importantly, visibly correct hyperpigmentation. Not only tackling current areas of uneven skin tone, the formula is infused with Niacinamide and Tetrapeptide-30, which work in synergy to prevent future occurences. Finished with an essential dose of Phytic Acid, the LYTERA 2.0 Pigment Correcting Serum enhances skin’s texture and leaves the visage visibly even and uniform in as little as two weeks. Expect a bright, refined and healthy looking complexion, as well as optimized results from treatments such as chemical peels and laser therapy. 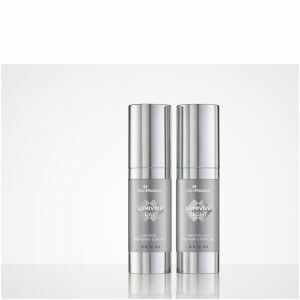 Free from retinol, parabens and fragrance. Non-comedogenic. Apply one pump twice daily after cleansing and toning the skin, in the morning and evening, prior to applying moisturizer and sunscreen. Lytera® 2.0 can be applied to the entire face, neck, chest, or other affected areas. this product is so amazing and is very useful for all discoloration of the skin like sun damage or pregnancy spot or aging spot. I have used the original Lytera for lightening face and hand freckles and age spots to good results. This version is even faster to lighten the darker spots. I will continue to use it as part of my regimen to have clear skin. My skin is combo oily, acne prone and when I do break out they tend to leave PIH, post-inflammatory hyperpigmentation. I am fair skin so the marks are red dots that just don't fade. I have been on the search for the product or products that help in lightening the marks. I have used hydroquinone but it didn't do much. I have been using the Lytera 2.0 now for 3 weeks and am so amazed that I am seeing results. Not that my PIH is gone but that they do look lighter. I try to use it 2x a day but I definitely use it at least 1x, at night. Patience and consistency is the key with skincare. Also, remember to always put sunscreen on in the morning or else the pigmentation will just come back. I love the bottle, a sleek white with silver, and with a pump. One pump is perfect for the whole face. The consistency is a white, lightweight, cream/gel like formula that spreads and absorbs easily, without leaving the face sticky or tacky. It layers beautifully with my other skincare products. The price is high, but so worth it. It will last awhile and it actually gives results. Medical grade skincare is an investment, but the outcomes are worth it. 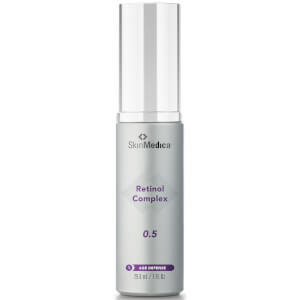 Been using Skin Medica for years - love the products. 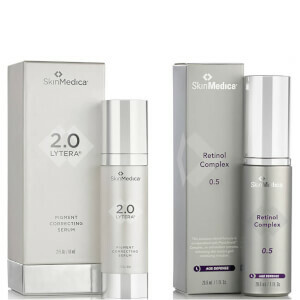 The new Lytera 2.0 Correcting Serum is superb.